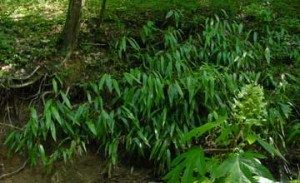 Bamboo is an ideal plant for erosion control. Running bamboos spread out forming a dense, underground network of rhizomes and roots making a very effective barrier to erosion. Planted along streams or gullies it can help to stabilize the sides. With two streams and a pond I’ve had several opportunities to try out different species in different situations and evaluate their effectiveness. One of my first plantings, specifically for erosion control, was in the bend of a small creek. With development upstream creating more and more run-off, the small streams on our place have changed over the years. Thirty years ago they were small streams that usually increased in flow after a hard rain but it was nothing dramatic and rarely caused much damage. Now, during the spring, these streams can swell to dangerous levels after a heavy rain and erosion has become a real problem. While I can’t do much about the source upstream I have been able to stabilize some of the worst areas downstream on my property. These streams naturally form S-shaped curves along their length. With the heavy flow in the spring the banks of these curves have begun to erode and in several places we now see red clay banks where before it was leaves and undergrowth. There is an especially bad stretch along my driveway where the damage is highly visible. 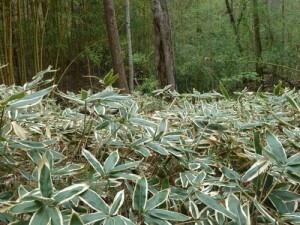 About five years ago I planted five Giant Leaf bamboo plants. The area is in full shade and the soil was just red clay. It took some time for the plants to establish and spread but now they have filled in nicely and cover an area about 20 feet long and 10 feet wide. The red clay bank is completely hidden and erosion has stopped in that area. Another area that I was concerned about was the back of a dam that forms a small pond. There is a concrete spillway that handles the overflow from the pond. When we built the pond about 20 years ago we made the spillway large enough to handle what we thought would be the maximum flow we could expect in the spring. Beside the spillway is an area that the water can go through in the event the flow gets to be too much. Water rarely flowed thru this area even in the heaviest rains but in the past few years it we’ve seen it overflow the spillway regularly going through the overflow area and down the back of the dam. We planted P.n.Henon in the overflow area about 10 years ago just because it was such an ideal place and looked so nice there. On the back of the dam we planted Sasa vetchii never thinking it would be needed for erosion control. This year water levels reached their highest levels ever. The Sasa vetchii was completely covered with flowing water and was flattened. After the water went down the bamboo sprang back up and looked fine. Best of all, there was no erosion of the dam!